An average house cat can jump over eight feet in a single bound, These natural abilities are accompanied by an innate desire to climb – to keep themselves safely out of reach, to find a comfortable spot for rest, or simply for fun. For house cats, tapping into this natural urge can be a challenge. Most owners don’t want their feline friend using countertops or curtain poles as a jungle gym, after all. That’s where cat trees come in. This crucial piece of furniture gives your cat a chance to exercise, feel safe, and follow their instincts – all while leaving your precious bookshelves well alone. Many cat towers also incorporate a cozy nook where cats can go to feel secure, and scratching posts for claw maintenance. With so many cat climbing trees to choose from, though, finding the purrfect option for you and your kitty can be more complicated than you’d expect. That’s why we’ve compiled this handy buying guide. 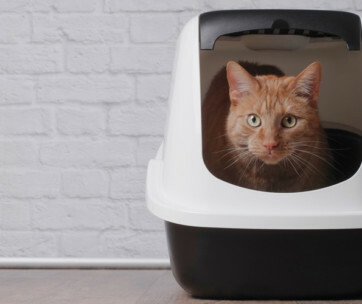 Below, we run through the top 10 pieces of cat furniture on the market right now. We’ve also taken the time to answer some common questions about choosing a cat tree, what types are available, and how your pet could benefit from one. 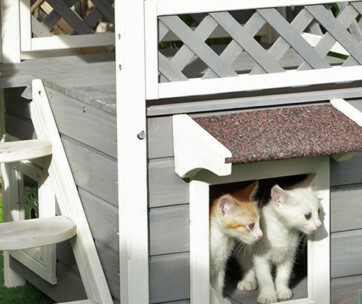 The first cat tree house to make our list is this versatile option by Go Pet Club. The tower is designed to meet all your cat’s needs needs in a single spot: it features two separate hidey holes where cats can rest away from prying eyes, each of which is accessible by a soft ladder. The tree consists of six separate platforms, supported by a sturdy base that keeps things stable as your feline friend leaps and climbs. Each of its posts has been wrapped in natural sisal rope, which is perfect for scratching purposes. The tree even features a built-in toy, suspended on a string from one of its platforms. Cats will love clambering over the tree whether for rest of play. 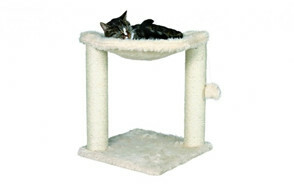 If space is at a premium in your home, this compact cat tree could be the perfect solution. Cats will love tucking themselves away in its raised hammock, which is coated in a soft plus coating for extra comfort. The small tower also features a suspended pom pom toy that cats love to bat and bite. Further down, each post is wrapped in natural sisal rope, giving cats a place to exercise their need to scratch, helping to keep their claws in tip top condition. All this is supported by a grippy and stable base, which keeps things balanced – even with heavier cats in the mix. Trixie say that their product is suitable for kitties of all ages and activity levels. It’s a great option for older cats, who can’t jump as high as they once could, but still need a little exercise. Its neutral beige color and understated design will fit in with pretty much any room. 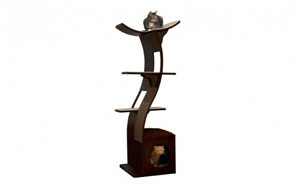 This elegant cat tree by Vesper features a fun art deco look, without the burden of being impractical. With a sturdy wooden base and platforms, it’s far more secure than many other options on the market, placing it among the best cat trees for large cats. Its four tier design provides your feline friend with three climbing platforms, and an enclosed cube-shaped bed. Inside the bed, and on each tier, grippy memory foam cushions keep cats comfortable and stable as they rest or explore. The tree also features a dangling cat toy, providing your pet with extra stimulation and fun. Each post is wrapped in sisal rope, too, giving cats the perfect place for a spot of nail maintenance. 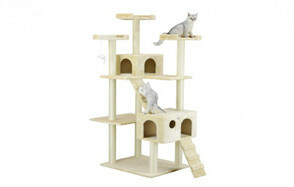 AmazonBasics have also created their own cat climbing tower – and with great success. Despite its budget-friendly price point, the tower is made with quality materials, and equipped to satisfy many of your feline’s needs. Each of its three platforms are coated in a soft, carpet-like material, keeping paws comfortable, and providing great grip at the same time. The top platform features a curved top rim, allowing it to double up as a cozy bed. Thanks to its stable base, the tree can take the weight of heavy and petite cats alike. As well as offering exercise and a safe space to sleep, the tree also gives your cat an appropriate scratching spot. Each supportive column is wrapped in scratchable, natural jute. The next of our cat stands is this tall and versatile option by FurHaven Pet. 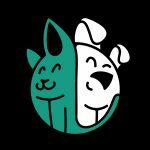 Their stimulating cat tree is perfect for energetic pets, proving them with a heap of entertainment and exercise. Each tower features a unique IQ Busy Box, filled with fun activities to keep your cat’s active mind engaged. The tree also features a built-in toy on its penultimate level – a spring mounted puff ball that felines love to bat about. With four different platforms to leap about on, your cat will be able to get the exercise they need with ease. The top platform features high sides, and also doubles up as a cozy resting spot. To help your cat meet their need to scratch – and to preserve your furniture – each of the tower’s columns is wrapped with sisal rope. This provides an appropriate spot for cats to give themselves a home manicure. With its unique and memorable design, our list just wouldn’t be complete without this cat condo from MidWest Homes for Pets. The striking floral design is a statement piece as much as a cat toy. 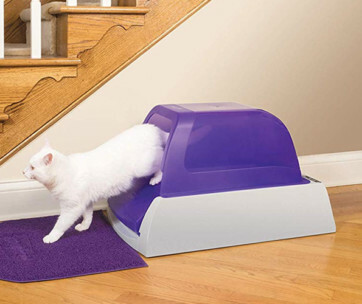 It features a two tier design, ideal for older or less active cats. Each platform is covered with a soft, faux fur fabric, on which cats love to get cozy. At the tree’s top sits a cylindrical bed, which allows cats to see out while they rest – perfect for kitties who love to people watch. The lower platform is equipped with a suspended toy ball, giving cats hours of entertainment when you’re not about to play. Both platforms are supported by a very sturdy base, so they can leap and play with confidence. Since no cat tree would be complete without a scratching spot, this base also features a sisal insert; ideal for catching up on claw maintenance. It’s easy to assemble too, and includes a one year guarantee. Molly and Friends have also earned themselves a spot on our list, with their stable cat tree – an ideal solution for large breeds. The tower features two large platforms, each of which is supported by a sturdy base. Its one piece design requires no assemble at all, so there are no loose screws for hefty felines to worry about. Each of the tree’s platforms doubles up as a cozy resting spot; one with a basket style design, the other a gently sloping ‘U’ shape. With two different beds to choose from, cats of all persuasions are sure to find a comfortable position for them. The columns which support these platforms are wrapped in extra-large sisal rope – the ideal scratching material for felines everywhere. If you’re searching for a tall cat tree, look no further than this lofty and elaborate design by Go Pet Club. With four platforms, a hammock, a ladder, and various hidey holes, the tower is ideal for those hyperactive kitties who just love to explore. Made from durable compressed wood, the tree is tough enough to cope with pretty much anything your feline cares to throw at it. Each platform is wrapped in a high quality faux fur coating, helping to keep your cat warm and comfortable, while also assisting their grip. With its condo, ladder, tunnel, basket, top perch, and hanging toys, the tree can offer active pets hours of entertainment. Each supportive column, and the rungs of the ladder at its base, are wrapped in scratchable sisal rope, helping pets to maintain healthy claw growth. The next cat tree to earn itself a spot on our list is by BestPet. At 73 inches, the tree allows your feline friend to reach impressive heights, giving them plenty of room to leap and play. Its six tiers are stabilized by a strong and sturdy base, which allows the tree to stay in place without any risk of tipping. Despite this stability, the tower is lightweight enough for easy manoeuvrability around your home. Along with its plain platforms, the tower also features two enclosed beds, so there’s plenty of space for multiple pets. Every surface is wrapped in an ultra-soft, lint-free material, too, keeping cats warm and comfortable, and providing plenty of grip at the same time. The only part of the tower not covered in this luxurious fabric is its columns. Instead, each pillar is wrapped in sisal rope, providing cats with a convenient scratching spot. For even more entertainment, one of the platforms even features a built-in mouse toy, suspended where cats can easily bat it. Last, but not least, is this unusual cat tree by The Refined Feline. True to form, this luxurious tower is refined indeed, featuring stylish faux suede, and hard-wearing wood. The tree consists of four platforms, a box bed, and an elevated lounging spot. Its weighted bottom keeps the tree impressively stable, so even the heaviest cats can’t knock it down during use. Sections of luxurious Berber carpet attach to each platform with a simple velcro mechanism, giving cats a comfortable and grippy surface, which can be easily removed for cleaning purposes. Finally, a sisal scratching panel at its base gives cats a safe and effective spot for their regular claw maintenance. With so many options to choose from, selecting the right cat tower for your pet can be something of a challenge. To help you work out which option is right for you, and to get the most out of your new purchase, we’ve compiled this useful buying guide. Your new cat tower will be rendered useless if you’re not careful to work with the dimensions of your home. Measure the spot where you want to place the tower carefully, and compare these measurements against the size of each option before making your final decision. If a tree features all three of these elements, it’s a good choice for your cat. Some trees also feature additional areas to explore, and built-in toys. Combining these features together is convenient for your cat, and it saves space for you, too. If your cat’s bedroom, play area, and scratching post are all in one spot, there’s no need to make room for extra items. Like us humans, cats can be fickle, and a tree that one kitty loves may be completely uncomfortable for another. For this reason, it’s important to be aware of your cat’s unique tastes before making a decision. If you’re unsure whether they’ll react well to a plush fabric, for instance, you could try purchasing a swath to introduce them to, and note their reaction. Stability is a crucial feature to watch out for when purchasing a tree for your cat - especially if they’re a large breed. Look out for stabilized, or wide bases, and always place the tree close to a wall in your home. Q: What is a cat tower? A: Cat towers, also referred to as cat trees, are a type of pet furniture, designed to help cats play, exercise, and relax. As the list above makes clear, cat trees vary significantly in size and complexity, but they all share the same basic structure: an elevated platform on which cats can play or relax. Most cat towers incorporate scratching surfaces, usually into their pillars, and many feature in-built toys and hiding spots. Q: How do I get my cat to use the cat tree? Q: Why won’t my cats sleep in their cat condo anymore? To encourage your cat back into their bed, it’s a good idea to wash ti with an enzyme-based cleaner every now and then, and consider providing additional sleeping spots for them to choose from. For us, the best cat tree on the market right now has to be this affordable but elaborate design by Go Pet Club. With its two cubby holes, multiple platforms, and built-in toy, the tree provides cats with everything they need. Each pillar is wrapped in natural sisal rope, too, giving cats a safe and convenient place to scratch - saving your soft furnishings in the process. The tower is sturdy, durable, and easy to assemble, making it a great all-rounder. At under $80, this piece of pet furniture is definitely a sound investment, and it’s earned our top spot without a doubt.